Wilson infamously dismissed quality problems in his products by saying that some women’s bodies “just don’t actually work” for Lululemon pants. NEW YORK — Chip Wilson, the founder of Lululemon, is stepping down as chairman after raising ire with his comments about the body types of potential buyers of the retailer’s yoga pants. The company also said Tuesday that it is appointing Laurent Potdevin as its next CEO. He succeeds Christine Day, who announced in June that she planned to resign. Chip Wilson said in a recent television interview that some women’s bodies “just don’t actually work” for Lululemon pants. He also said that thigh rubbing over time will cause the pilling and poor performance of the pants. Lululemon was receiving complaints about the sheerness of some of its pants, which made them see-through at times. Customers also complained of pilling after a few months of wear — or even just a few uses — and about holes and seams coming apart. The retailer pulled its popular yoga pants from store shelves in the spring, blaming problems on a style change and production issues. New pants have since hit stores, but the sheerness complaints have continued, in addition to the new gripes about wear and tear. Wilson did seem to apologize to Lululemon’s workers for the criticism his comments received, but didn’t retract his original statements. Analysts that follow the company believe Wilson alienated some core customer and potentially opened a door in the lucrative market to rivals like Nike, Under Armour, Athleta and others. Spending on workout clothes jumped 7 percent to $31.6 billion during the 12-month period that ended in August from the same period a year ago. That compares with a 1 percent rise in spending for other clothing to about $169.2 billion. The Canadian company named lead director Michael Casey as chairman. Wilson will resign before the company’s annual meeting in June, at which point Casey will assume the role. Wilson will still have a seat on the board. Laurent Potdevin, the new CEO, most recently served as president of Toms Shoes. Before that, he spent more than 15 years at snowboard company Burton Snowboards in various positions, and as CEO from 2005 to 2010. Potdevin is expected to take over in January. He will also become a board member at that time. 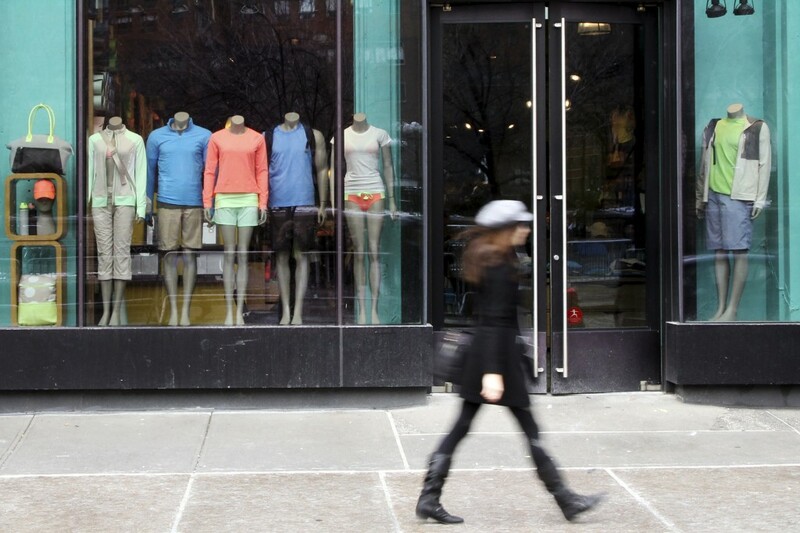 Day is anticipated to stay with Lululemon through the end of its fiscal year to help with the transition. Shares of Lululemon Athletica Inc. gained $2.06, or nearly 3 percent, to $72.40 in premarket trading on Tuesday. For the year to date, the shares are down 8 percent.